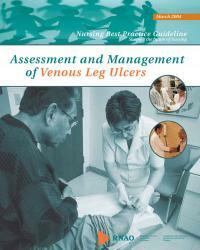 It is the intention of this guideline to identify best nursing practices in the treatment of venous leg ulcers. promote the responsible use of healthcare resources. Practice Recommendations: directed at the nurse to guide practice regarding assessment, planning and interventions. Education Recommendations: directed at educational institutions and organizations in which nurses work to support its implementation. Organization and Policy Recommendations: directed at practice settings and environment to facilitate nurses’ practice. It is expected that individual nurses will perform only those aspects of venous leg ulcer assessment and management for which they have appropriate education and experience. Further, it is expected that nurses, both RNs and RPNs, will seek consultation in instances where the client’s care needs surpass the individual nurse’s ability to act independently. It is acknowledged that effective client care depends on a coordinated interdisciplinary approach incorporating ongoing communication between health professionals and clients, ever mindful of the personal preferences and unique needs of each individual client.